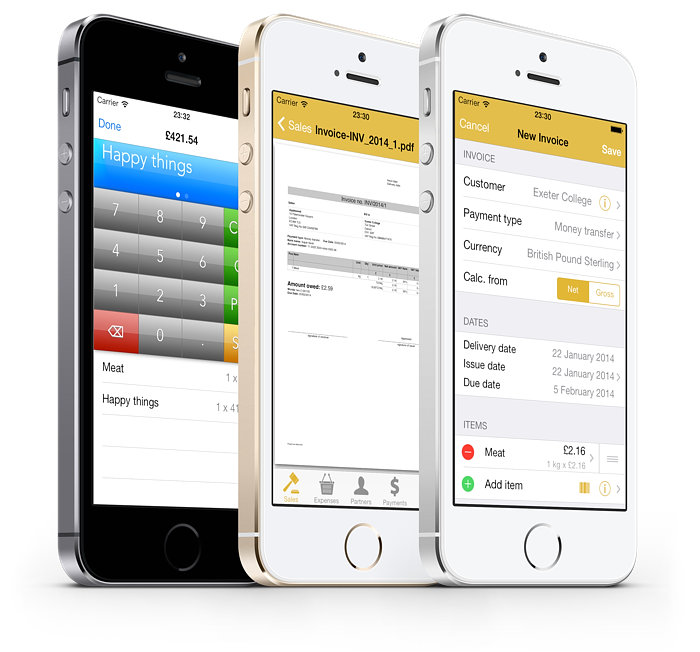 With MyInvoice you will lead your business with your iPad™, iPhone™ or iPod touch™. Easy invoicing always at hand! MyInvoice is the most powerful and still simplest in use invoicing application. 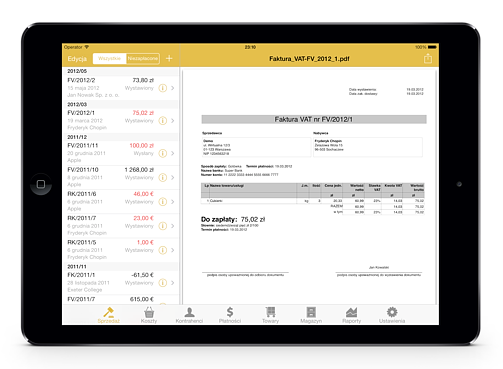 With just few taps you can create invoice and send it to your customer as PDF or print it on your mobile printer. It uses quite classical approach to create documents, so everyone should feel familiar. Simplicity doesn't mean lack of features. MyInvoice is very powerful! You can create invoice documents, receipts, pro forma documents, expense documents, quotes and track payments. Also, You will have full stock management! Manage custom discount rules for customers and wares. Did we mention, that MyInvoice supports multiple companies and multi currency? Your clients will love dual language invoices. Tracking payments is as powerful as on desktop software. Documents (invoices and expenses) can be paid partially or be overpaid, they can also be compensated. Also, one payment can be attached to multiple documents. Every payment information is stored in MyInvoice, so You can check when and who paid you. Cash flow also creates special cash documents - you can give them to your customers to confirm cash operations. Easily synchronize all datas across all devices! Just switch on synchronization, sign into your Dropbox account and wait for synchronization to be done. No duplicates, all your data are only yours. Documents can be send to customers as PDF documents. They are generated completely internally in your device, so Internet connection is not required or sharing your data with third parties. You can also print documents directly from your device using AirPrint™ or open them in external applications supporting PDF (like iBooks, Dropbox, etc). Of course, You can embed Your company logo, background or any other unlimited number of pictures or photos in any place on printed page. PDF files may be encrypted to make your documents read only. Do you sell on site? Do you need to give an invoice, order or payment confirmation to your client immediately? MyInvoice supports mobile printing on Woosim mobile thermal printers! It uses Bluetooth interface. All printers are Apple certified devices. Simplify your retail sales. MyInvoice have built in POS terminal with superb barcode reader (powered by ZBar) which will turn your iPhone, iPad or iPod into simple cash register. Hardware barcode readers are also supported, just connect Bluetooth enabled barcode reader (keyboard mode) or RS232 barcode reader (with LAN to RS232 converter) and scan codes everywhere. 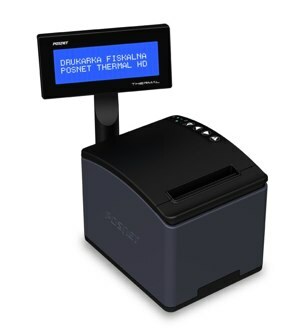 Some countries require from you to use fiscal printers for retail selling. MyInvoice allows to print invoices and receipts on fiscal printers made by Posnet! We recommend Posnet Thermal HD fiscal printer with built in LAN port. Posnet fiscal printers are currently supported only in Poland. Probably You will not forget to remind your customers for payments. But what with deferred payments for Your suppliers? Did you forgot about them? Now you can track expenses similarly to invoices. You can also attach scanned documents to them - just choose already taken photo scan from Photo Library or make a shot with built in Camera, you can also attach any PDF file from other third party apps. We recommend to use third party software InstaPDF for great scanning solution (find them in App Store). Don't mix your private Address Book with your business Address Book. Now You can have completely separate clients Address Book in MyInvoice. You can make changes in customers address and see what has changed (already issued documents will have previous data instead of new one). If you have occasional customers which You don't want to have in Your customers database, it's also possible. Create income document and create customer within that document and check proper switch to disable storing that customer for future. But, if you make again some business with that customer, he will be found and popped up to use the previous one. So, you will not make customer duplicates anymore. Within customer you can also find all his documents and payments, and also check his balance. Manage your stock, goods and services like as in your shop. Products database includes full description about your goods and services, including SKU codes, EAN codes or goods classification codes (used in European Union) and it's photo. Using wares database is not required, as you can create ware items directly in income documents. There you can also attach serial numbers to goods being sold - this information will be printed on invoices and will allow you to track guarantees. Items can have prices in multiple currencies. Simple stock management will allow to control stock incomes and outcomes. Same software for Whole World! MyInvoice was created to be used on whole world, first designed in Poland for European Union businesses and now expanded to United States, Canada, Australia and to all other countries which use other than VAT tax forms. Yes, you can enter all your VAT, GST, PST, QST or any other compound or grouped taxes - without any limitations! Your products may have prices with inclusive or exclusive taxes. All UE countries has predefined taxes and validation of postal codes, IBAN bank account numbers and VAT IDs - you will see warning sign when something is wrong. 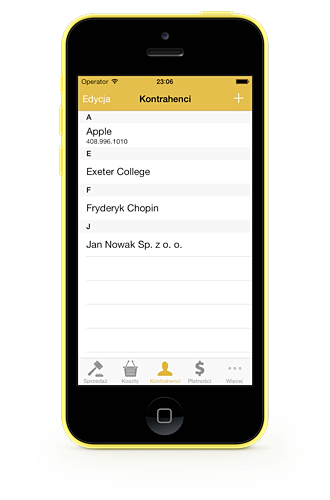 Currently supported languages are English, Polish and Russian (if You want to make translations, please contact us). You can also translate PDF documents to any language You want. For non-VAT countries, like US, CA, AU we provided simplified invoice template which will fit your needs and specificity of your countries. MyInvoice supports both A4 and US Letter paper sizes. For Russia we have special invoice template which conforms Russia Law! Import data into MyInvoice just with few taps. Create your products and customers database in your favorite spreadsheet, save them as CSV file and import them with Dropbox. You can also exchange data via Dropbox. You can also exchange photos with directly from your web commerce software - just point right URL to your image. Got other invoicing or accounting software? You can exchange data with it! MyInvoice can import and export documents, products and customers data within simple XML file. MyInvoice can also exchange all the data with Polish software: Maktura and InsERT (Subiekt GT, Rachmistrz GT). MyInvoice is not end product. We have plenty of ideas that we will implement in our software, keep eyes on it! If above features are not enough for You, or your country has special documents (like in Poland, we have Margin Invoices), please contact us - we will try to implement them for you without additional costs - it's very hard to know every nuance for each country in the world.